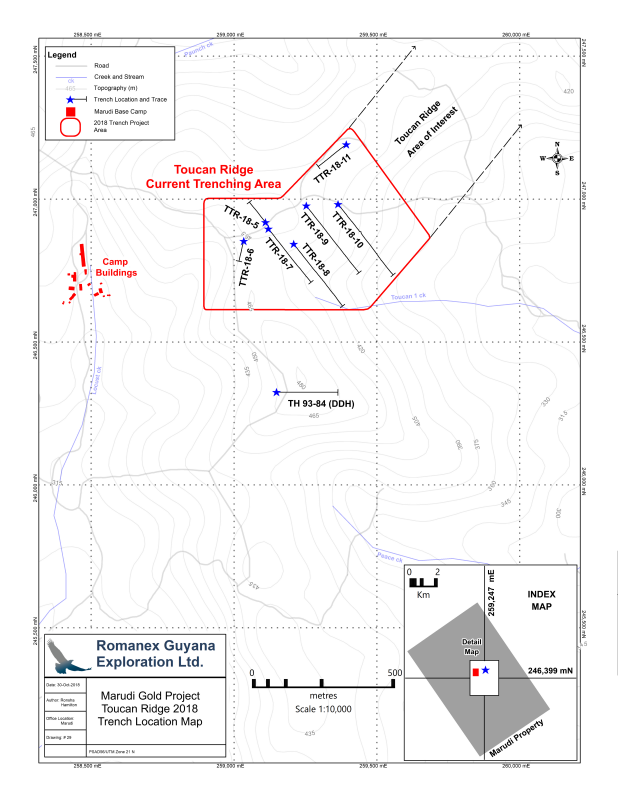 November 1, 2018 / TheNewswire / Vancouver, Canada - Guyana Goldstrike Inc. (the "Company" or "Guyana Goldstrike") (TSXV: GYA, OTC: GYNAF, FSE:1ZT) is pleased to report assay results from Trench TTR-18-08 at the Toucan Ridge area on its Marudi Gold Project ("Marudi" or the "Property") located in the Guiana Gold Belt, Guyana, South America. 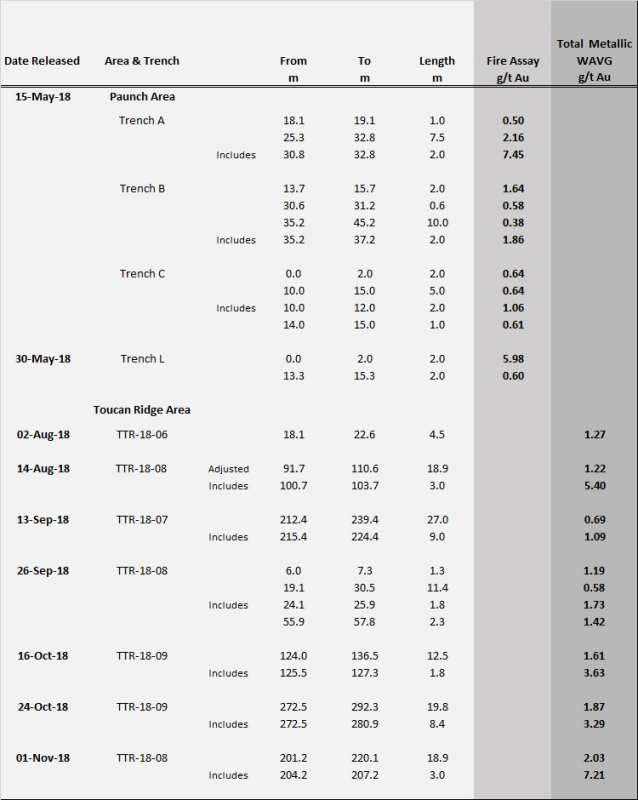 Trenching successfully exposed the quartzite-metachert (host rock) in place with resulting assays returning values of 7.21 g/t Au over 3.00 metres within 18.90 metres of 2.03 g/t Au. The assay results are from samples taken in hard and slightly weathered rock of the quartzite-metachert. These are the final assays from trench TTR-18-08. Additional assays are pending from trenches TTR-18-07, TTR-18-10 and TTR-18-11 and will be released once received and reviewed by the Company. The technical team continues to trench along Toucan Ridge, progressing in an eastward direction. Please view below, "Table of Significant Gold Assay Results to Date" for all trenching results on the Property to date, and "Toucan Ridge Location Map" for the location of the Toucan Ridge area of interest and trenches. A total of 1748 metres of trenching has been completed and 518 samples taken at the Toucan Ridge area. The area of interest continues for more than 1.75 kilometres to the east of trench - TTR-18-06. To date, a total of 7 trenches have been completed within the area of interest. Trench sites are planned where quartzite-metachert is exposed or interpreted to occur beneath the transported overburden.